A 35-acre plot in Jerusalem is the navel of the world, focus of theological geopolitics and gateway to Heaven in three great religious traditions. It may also be the most dangerous place on earth, as Israeli journalist Gorenberg demonstrates. Israel has sovereignty over (but not management of) what Jews call the Temple Mount, the spot where they believe Abraham prepared to sacrifice his son, where the First and Second Temples stood. Muslims call that same spot Al Haram al Sharif and identify it as the place from which Muhammad ascended to Heaven. 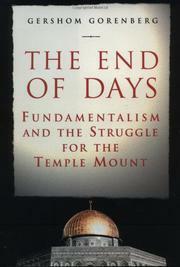 Many fundamentalist Christians believe the End of Days is nigh and a messianic millennium will follow the destruction of unbelieving Jews—after they erect a new Temple. Some Jewish fundamentalists, anxious for the messiah's first coming, prepare to nudge the Almighty by erecting a Third Temple in the place where Solomon built the first. The necessary ingredients, like a sacrificial pure red heifer (provided by American believers), are being gathered. Muslims understand that Al Aksa and the Dome of the Rock, at their third most holy venue, are threatened. They react violently to any perceived incursion as they also await the end of time and the militant victory of Islam. Despite urgent eschatological beliefs, different holy places cannot occupy the same place at the same time until some laws of physics are divinely abrogated. Attempts have been made to destroy the Dome. Self-righteous murders have been committed as theological necessity. If terrorism ignites catastrophe, it's all according to revelation, prophesied in the intoxicated view of true believers. This real specter must be acknowledged in any discussion of prospects for peace in the Middle East, Gorenberg argues in this valuable analysis of millennial politics. It's truly Apocalypse Anytime Now. An important and necessary book.